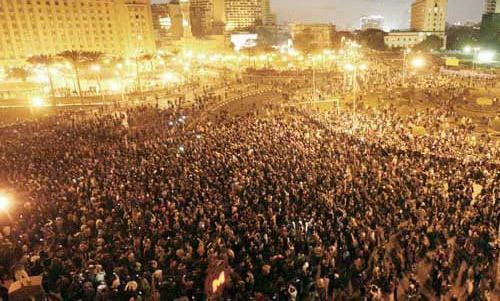 The American AFL-CIO , the International Confederation of Trade Unions and the communist controlled World Federation of Trade Unions are all throwing their wight behind the unfolding Egyptian revolution. A general strike, to continue until Mubarak's government falls, has been called by the newly formed Federation of Egyptian Trade Unions. The AFL-CIO, America's main labor federation, along with nearly all the rest of the world's trade union movement, has thrown its weight behind Egypt's pro-democracy demonstrators. More specifically, world labor is in solidarity with the Federation of Egyptian Trade Unions and its call for the nationwide general strike, aimed at bringing down nearly three decades of Mubarak's dictatorship. "The people's movement for democracy in Egypt and the role unions are playing for freedom and worker rights inspires us and will not be forgotten," Richard Trumka, president of the AFL-CIO, said in a letter to the Egyptian organizers. Trumka's letter was to Kamal Abbas, the general coordinator of the Center for Trade Union and Workers Services, and Abu Eita, leader of the Real Estate Tax Authority Workers. Both organizations have been instrumental in pulling together the FETU, which Trumka welcomed into the international labor movement. FETU's first act was to plan the nationwide general strike. A Jan. 30 press release announcing the formation of the FETU - an alternative to the government-run Egyptian Federation of Trade Unions... stated that "the labor movement is in the heart and soul of the Egyptian Peoples' revolution and its emphasis on the support for the six requirements as demanded by the Egyptian People's Revolution." The same day, organizers held a press conference in Tahrir Square, announcing the FETU and the "formation of committees in all factories and enterprises to protect, defend them and to set the date for the general strike." According to Sharan Burrow, general secretary of the International Trade Union Confederation, "This is a hugely important step for all Egyptians, who have for so long been denied the right to democratic representation at work." "Independent unions, which the regime refused to recognize, have organized thousands of local strikes, sit-ins and protests in recent years, and have been a moving force behind the massive mobilization of Egypt's people that we have been witnessing in recent days," she continued. The AFL-CIO is a member of the ITUC, which represents 176 million workers in 151 nations. The World Federation of Trade Unions, which represents millions of workers in dozens of countries, also sided with Egypt's workers. "The working class of Egypt is leading this struggle and we wish them success in their targets," read a WFTU press release. "We demand from the government of Egypt to immediately stop the murders and arrests of demonstrators." 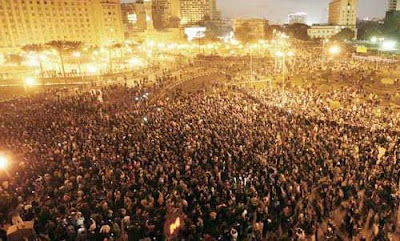 The general strike will continue, organizers say, until Mubarak goes and the people's demands are met. While many commentators are understandably focusing on the role of the Muslim Brotherhood in the Egyptian turmoil, there is no doubt that the international left is a playing a leading and perhaps decisive role in this disaster in the making. Are they really THAT stupid? Pretty obvious that one obnoxious regime is going to be replaced by an even more obnoxious state; an islamic state that won't allow free labour movements/ trade unions; women to be sent back behind house walls, not in the work force.